Charubala Mohan found that her darling child had lost his sight while yet a baby. And soon, she lost her husband too. Fortunately her musical training as a student of Sangita Kalanidhi T.K.Jayarama Ayyar and the musical aptitude of the child indicated the direction in which she should mould the future of her son M.Chandrasekharan. And she did it with satisfying results. For M.Chandrasekharan, she has been not only a mere mother, but was his Guru and God. And the mention of her name brings tears of remembrance and loving gratitude in his eyes. Born on December 11, 1937 at Calcutta of Mohan, Manager J.K.Cotton Mills, Kanpur and Charubala, Chandrasekharan lost his eye-sight by the age of two. He learnt music under his mother and later under Mannargudi Sambasiva Bhagavathar and Kumbakonam Viswanathan; Jayammal taught him padams, etc. Vidyala Narasimhalu Naidu also had him as his disciple. Chandrasekharan soon became an accomplished violinist (and a vocalist) and made his debut in 1949 at the most befitting venue of Thyagaraja Vidwat Samajam. In 1950, he won the prize for the best violinist from the Music Academy, Chennai. He soon blossomed into one of the prominent and top-ranking violinists of the day and he is kept busy by admiring music lovers all over India during the last three decades. M.Chandrasekharan is an excellent accompanist eagerly sought after by vocalists as his play blends with theirs like a flower and its fragrance and flows in rich unison. He gives solos with his daughter, Bahraini Gopalakrishnan to second and has won laurels. He had accompanied the top cream of Carnation music like Maharajapuram Viswanatha Era, G.N.Balasubramaniam, Madurai Mani Ayyar & practically all the present senior vidwans. His voco-violin concerts are popular. He is free from eccentricity and is an artiste popular with colleagues and the audience. G.Duraiswamy Ayyangar had the distinction of undergoing gurukulavasa for such a long period of twenty-two years under the distinguished Poochi Srinivasa Ayyangar that he was the natural preceptor to his son, Chellam Ayyangar. At the age of ten, Chellam Ayyangar made his debut at the Tyagaraja Aradhana at Salem starting a five-decade long musical career. Since 1940, he had given over 250 concerts on the All India Radio alone and since 1943 has been participating in the programmes of Music Academy, Indian Fine Arts Society, etc., with the accompaniment of reputed supporting artistes. His dedicated and traditional concerts are well received. Award from the Music Academy, Madras in 1975. Vocalist, violinist and musical discourse performer, Chinna Sathyanarayana studied under Kamalapati Akkaji Rao, Mangalampatti Pattabhiramayya, Dwaram Venkataswamy Naidu, Narasinga Rao and Dr. S.Pinakapani. Was the principal of a music college and giving concerts. Teaching is his favourite field of activity..
Sangeet Natak Academy Award in 1988. 'We have been waiting to give this pendant, and the title 'Vainika Sikhamani' which was given to Sri Veena Seshanna a hundred years back to some renowned Vainika who reminds us of the Great Vainika and that Day has come now'. The illustrious royal patron and man of letters honoured Chitti Babu with the pendant and the title. A gifted artiste, Chitti Babu coaxes out of veena 'the esoteric secrets of sound that it treasures in the depths of its soul'. He is noted for sweet, pleasing rendering rich with intricate and subtle turns, graces and embodiments. He is highly popular and his concerts are noted for dignified play on the celestial instrument. The only child of Challapally Ranga Rao and Sundaramma of Kakinada, he was a child prodigy. Made his debut at the age of twelve. He had his initial training under Appalachariar for three years and then under the distinguished Emani Sankara Sastri. He had been giving hundreds of concerts on the All India Radio including National programmes, Television, Sabhas and elsewhere in India and abroad. His 'koel' song is a remarkable piece. A film called 'Kalai Koil' has come out based on his veena play. "It is a feature of a violinist's career to burst abruptly into view", Menuhin has said. This is very true of ace violinist, Shri T.Chowdiah. His studies were stopped in boyhood to enable him to concentrate on music, in which his mother imparted early lessons. His uncle then took him to learn music under the veteran musician, Sri Bidaram Krishnappa of Mysore. Their association lasted fro about 20 years, during which Chowdiah progressed from discipleship to accompanist. Sri Chowdiah was a very painstaking sishya and mastered on the violin, ragas, kritis, swaras, etc. When he made mistakes, his guru used to chastise him & all this rigorous training enabled Chowdiah to become a mature and full-fledged violinist. In the second and third decades of this century, Chowdiah came to notice the lowering of Adhara Shruti by vocalists. Amplification was not known then. The accompanist was therefore at a disadvantage, as his violin sound did not carry well and far enough to the audience. This set Chowdiah's active mind working on a method of rectifying the handicap. With the aid of a craftsman, he was able to fashion a seven-stringed violin, the sounds from which were agreeable and voluminous. Mysore Asthana vidwan Seshanna is reported to have been greatly impressed by it. Handling such a complex stringed instrument, however, needed skill to tailor it to Carnatic music. Chowdiah showed the way, which was later followed by his disciples C.R.Mani, the late Sethuramaiah and others. Chowdiah was a powerful and popular violinist for many decades. He was called upon to accompany veterans like Chembai Vaidyanatha Bhagavathar, Ariyakudi Ramanuja Iyengar, Alathur Brothers, G.N.B, Musiri Subramania Iyer, Semmangudi Srinivasa Iyer and Madurai Mani Iyer. Percussionists like Dakshinamoorthy, Palghat Mani Iyer, Palani Subramanya Pillai were fellow-accompanists to him in dozens of concerts. Sri Chowdiah became Mysore Asthana Vidwan in 1939. The Music Academy, Chennai conferred the title of 'Sangitha Kalanidhi' in 1957 on him. 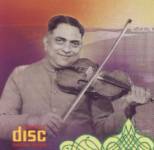 He was also known to give solo violin concerts along with Gururajappa, C.R.Mani, Mysore Doraiswamy Iyengar, etc. His wide ranging accomplishments included his own inspired compositions like kritis, thillanas, etc.